Learn about the area you are travelling to – the potential parasites and common risks e.g. if you are heading east remember to watch out for paralysis ticks. Ensure your pet is microchipped and the contact details are up to date with the microchip database. Make sure you have enough supply of your pets medications and contact details for your vets. If you are heading into a warmer area consider clipping long coats before you leave. A car can be a risky place for a pet, with temperatures getting extremely high on hot days. As animals tend to dehydrate much quicker than humans, ensure you have regular drink stops. Birds are very sensitive to extremes, so try to keep them away from direct sunlight and the air conditioning vent. 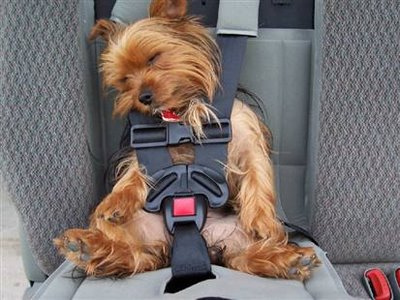 If you are travelling by car, it is important your pet is appropriately restrained. For dogs, fitted guards in wagons and four-wheel drives are ideal. Alternatively a cage can be used, or harnesses that attach to the seat belts. Cats should be secured in a cage or carrier with litter box. Like humans, some cats and dogs get car sick. While medication can assist with this, we also recommend you try and acclimatize your pet to the car by taking them on a few short trips close to home. If you are travelling by plane, check requirements with the airline some will ask for a fit to fly certificate from your vet. Sedation is generally not recommended, as side effects may be unpredictable at high altitudes. Take the time to get your pet used to their carry crate before the day of travel.